How far ahead should I shop for my wedding/bridesmaids dresses? How long does it take to order a wedding dress? We would suggest you start looking for your wedding dress approx 1 year ahead of your wedding date and you should not start shopping for your dress until you have your wedding date and your wedding venue booked and confirmed, the reason we say this is because the time of year and the type of venue you choose to marry in will affect your choice of dress, for instance a bride who is travelling abroad to get married is going to want a completely different dress to a bride who is having a traditional church wedding. You may think a year ahead is too far ahead, however, most bridal designers will take approx 5-6 months to deliver a dress to us once you have chosen your dress and placed your order and of course it may take you several months to make up your mind which dress you would like and then of course we would like to allow a couple of months for final fittings and alterations. Bridesmaids dresses take approx 4-6 months to come and we usually allow approx 2 months for fittings and alterations. If you don’t have a year to shop for your dresses, please don't worry, we always do our best to find you a dress in the size and style of your choice and some of our suppliers do offer rush orders, although this will generally incur an additional fee, so if you have the time it is generally better to order well ahead. Will I have to pay for my dress/es all at once? No, the usual ordering procedure is a down payment of 50% of the value of your dress and then the remaining 50% will be due for payment when your dress arrives in store. Your wedding/bridesmaids dresses must be paid for in full before we will commence on alteration work to your dress/es. We do offer a number of payment plans but this will depend of the amount of time you have available before your wedding. If you were to purchase a shop sample, in other words off the rail then you will be expected to pay for the dress in full. Alterations are not included in the cost of the dress unless we have specified this at the time of ordering. We offer a full in-house alterations and fittings service at all 3 of our stores, and our staff are all experienced and qualified professionals. You will be advised when you come to your dress fitting of what work may be required and we can usually give you an estimate of what the alterations costs may come too at this stage, we have a minimum fee of £40 for bridal alterations and a minimum fee of £30 for bridesmaids alterations. Who shall I bring along when I come to try on dresses? We would always recommend you don't bring too many people with you, usually 1 or 2 people is enough and preferably a close friend or relative, (i.e. your Mum, sister, close friend) someone whose opinion you value and trust. We have had occasions where brides have come along to try on dresses with 5 or 6 people, in our experience this is seldom productive for either the bride-to-be or for us, as there are too many conflicting opinions and the bride-to-be will find it hard to concentrate on herself and what she would like. Much as we love children, we would suggest its best if you can avoid bringing them along, small children quickly become bored and you will not want to be distracted by their needs whilst making such an important decision as choosing your wedding dress. 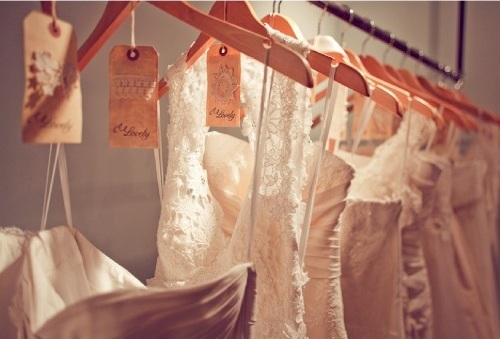 Shall I bring my bridesmaids along with me to my bridal appointment? We fully understand why people sometimes feel the need to take photos, but unfortunately do not allow it for several reasons, the first being copyright issues, the second being in our experience it is not helpful as you will end up with so many images of yourself in so many different styles it becomes completely confusing, and thirdly unless you have a professional photographer, the correct lighting, your hair and make up done, chances are these images are not going to be good. This is why we recommend you concentrate on the styles of the dress and how you look and feel in them rather than collecting up loads and loads of images. You are always welcome to come back for a further appointment to try on your favourites again and there is no substitute for actually trying on the dress with one of our experienced stylists on hand to help advise you and answer your questions? Do I need to bring anything along with me to my appointment? If you have a strapless bra this can be helpful when trying on strapless dresses, we would suggest also bringing along a pair of heels if you intend wearing heels on your wedding day as this will help give you an impression of how the dress will look on the day. We would suggest you wear light coloured underwear if possible. It can also be useful if you intend to wear your hair up for your wedding to have it styled in a similar way when trying on headresses and veils and keep make up to a minimum as most of the dresses are put on over your head and make up can sometimes rub off onto the dresses. Our course these are all just suggestions and we are quite happy to offer a pair of our shoes to try on and if you are wearing your usual bra we would generally just tuck in the straps where necessary. We keep a range of sample dresses in both stores in a range of sizes, these dresses are for brides-to-be to try on and then once you have made your choice you will be measured and a new gown will be ordered from the dress designer, this dress will usually be made in the nearest standard size which matches to your measurements and then altered to fit if necessary when it arrives? What happens if I lose/gain weight? We understand that it can sometimes be difficult to maintain exactly the same weight at all times, and always try to be sensitive to the needs of our customers. In the past we helped many, many customers who have lost/gained weight due to health issues, diet, pregnancy and a number of other factors. So please be assured we will always try our best to be understanding and helpful and if you have any worries or concerns then speak to a member of our staff who will be happy to help and advise you of the options available. If you have any other questions/concerns please feel free to contact us we are always happy to help.